Many encoder types available on the market have a built in mini-USB or micro-USB socket connected to the data interface port. Although a USB connector is used, most devices do not have an electrical USB interface to be directly connected to a PC. However, a standard USB cable can be used to connect to the encoder's USB socket on the encoder side. For the connection on the Caliper2PC interface side, the USB cable can be soldered to a RJ45 patch cable or to the adapter PCB. For the connection of higher quality devices (eg. Mitutoyo Digimatic devices), special SPC data cables are available. 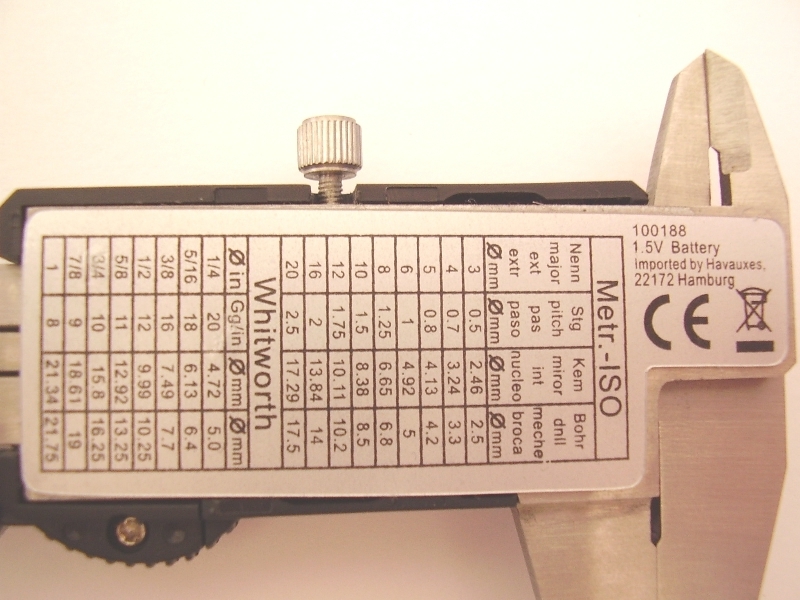 Linear glass scales, as well as linear magnetic encoders have a built-in cable to be connected to a quadrature adapter and to the Caliper2PC interface. 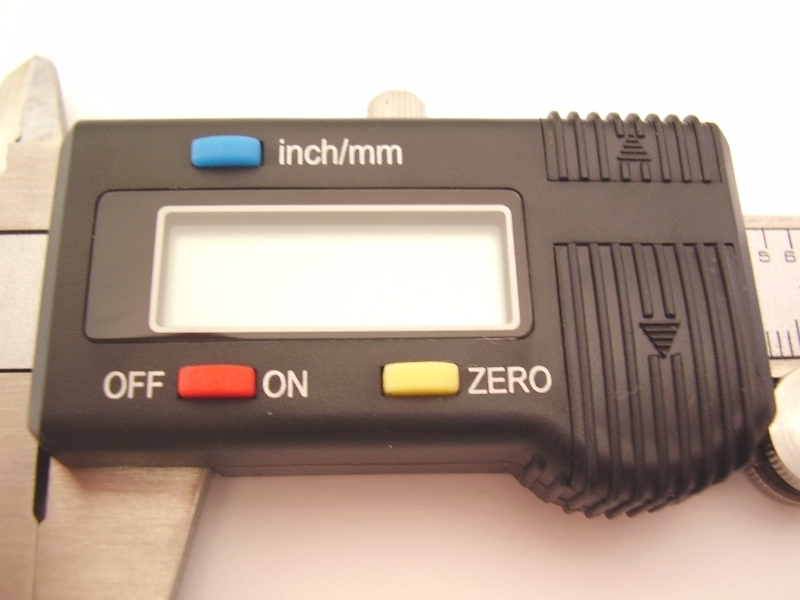 DigiMAG iGaging and Shahe linear scales with external displays also have a built-in USB cable. Connecting these devices through their built-in cables, no soldering on the scale PCB is required. Adapters are needed to convert the different protocols used by the different devices to a protocol supported by the Caliper2PC interface. If the encoder is big enough, the adapter can be mounted inside the encoder housing. Otherwise the adapter can be connected at any location between the encoder and the Caliper2PC interface. There are many devices on the market (mostly cheap Chinese calipers) that have a data interface and data pins on their PCB. Finding small sockets that fit to the encoder PCB pins might be difficult. 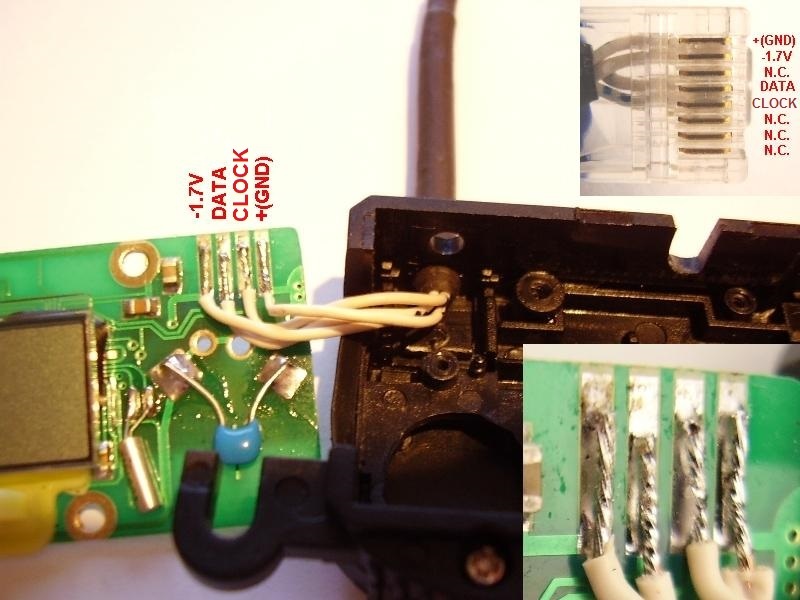 A proper connection without any loose connections can be accomplished by soldering the data cable to the encoder PCB. However, the soldering job as well as disassembling the caliper must be done carefully. 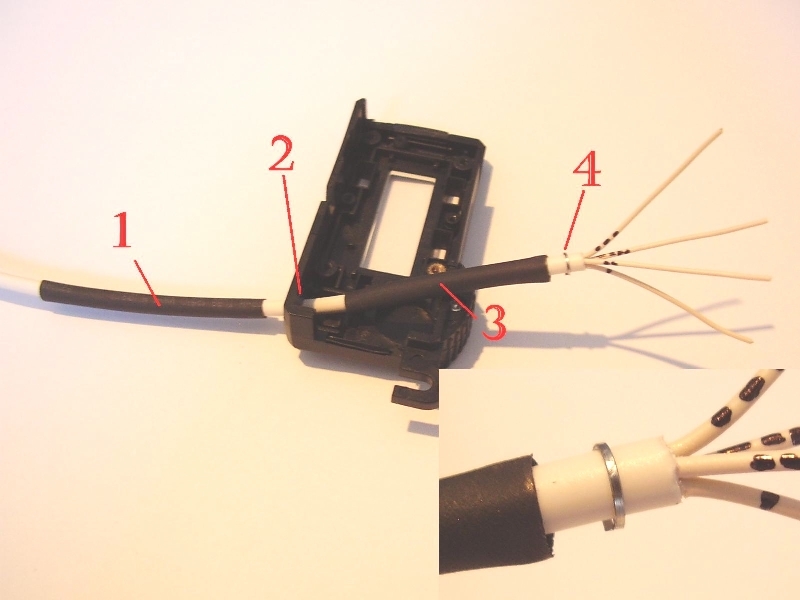 On this page a step by step description on how to connect a data cable to the encoder's PCB is presented. Figure 1 and 2 show the caliper before it is disassembled. · Carefully remove the sticker on the back side with a box cutter. · Glue residues can be easily removed with cotton wool and some oil. Fig. 3 shows the housing screws that must be opened. 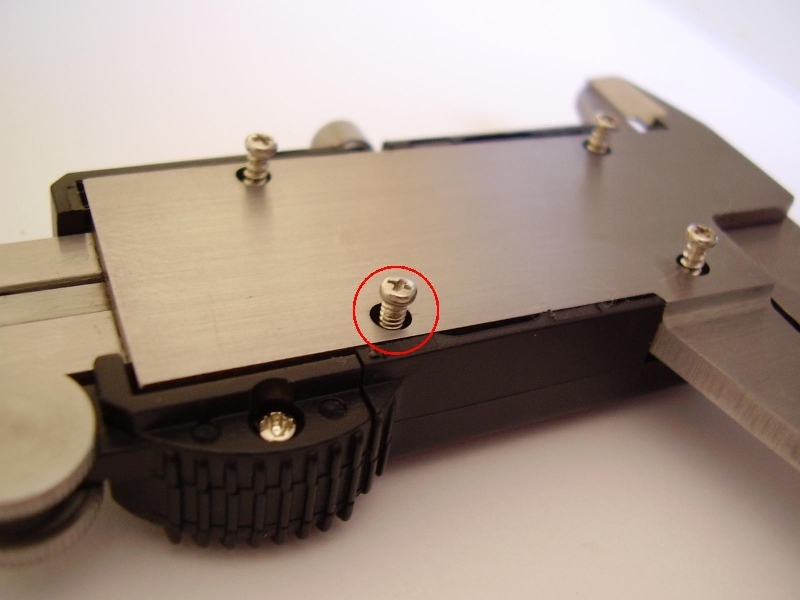 Please note that one screw has a different thread than the other 3 screws. This must be strictly observed when assembling the caliper. · Next, the encoder housing can be removed. The encoder is mounted in the housing with four small screws. Fig. 4: Positions of the four encoder fixing screws. Fig. 5: Encoder PCB, housing removed. · First the right location in the enclosure must be found where the data cable can be inserted. The data cable should have enough space between the housing and the PCB. For the type of caliper described here, the location at the data interface lid seems most appropriate (see Figure 6). Fig. 6: Drilled data interface lid. · After marking the hole position, the hole should be pre-drilled with a small drill (about 2mm diameter). As a result, the drilling forces are smaller and the hole will turn out more precise. The final diameter should be 3.6 mm - 3.7mm and can be drilled by hand with a sharp metal drill bit. · After drilling, the interface lid can be fixed with superglue. · The data cable should be a thin and flexible four-core cable. If the wires have all the same color, the cable should be measured and marked with a marker to distinguish them. Fig. 7: Order of cable entry before shrinking. · Before shrinking the first heat shrink tubing, the metal ring must be positioned about 2 mm before the end of the cable insulation. 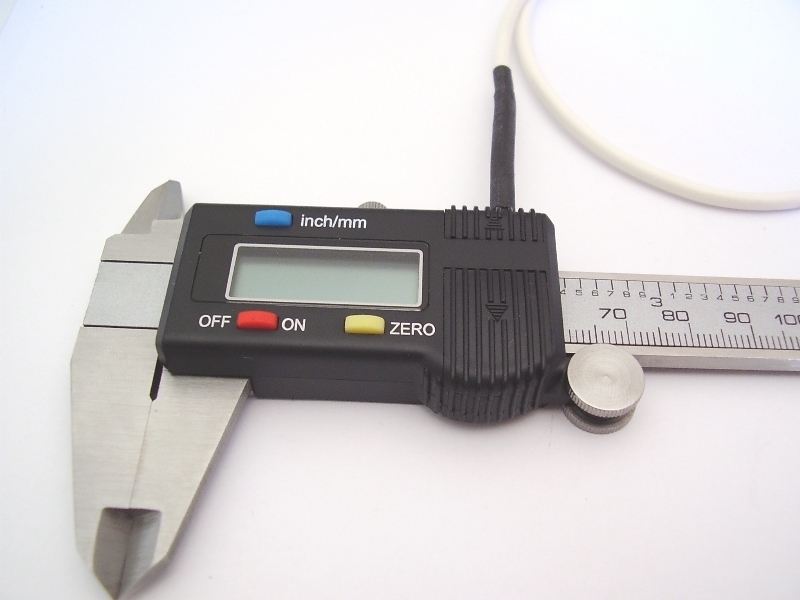 · The heat shrink tube is slipped over the metal ring and then shrunk. A hair dryer or the hot soldering iron tip can be used to shrink the heat shrink tubing. While shrinking, the metal ring is pressed around the cable insulation, so that a firm connection is created. The resulting thickening (see Fig. 8) prevents the cable from being pulled out of the encoder housing when pulling the data cable. Fig. 8: Data cable after shrinking of the first heat shrink tubing. 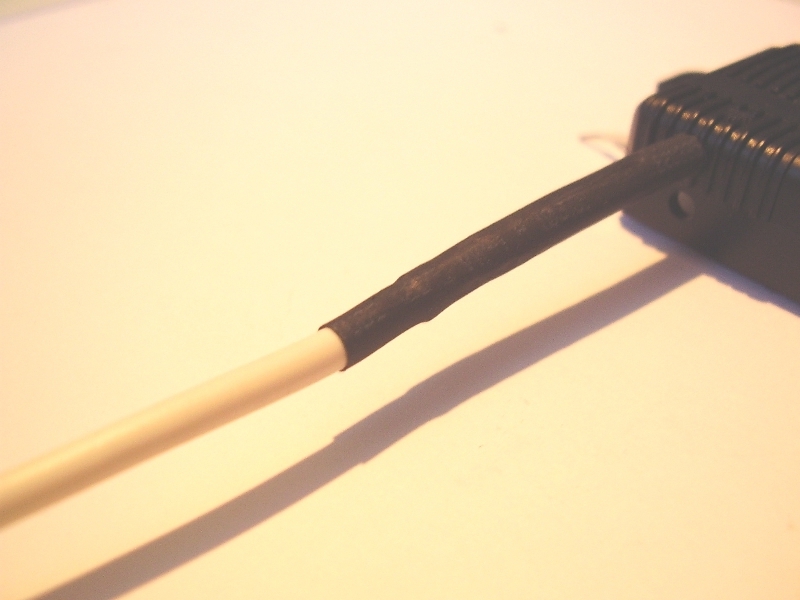 · Next, the data cable with the shrinked heat shrink tubing is pulled through the drilled hole until the thickening. · To complete the fixation of the data cable, the not yet shrunk heat shring tubing is pulled over the cable with the shrunken heat shrink tubing to the encoder housing. · Then it is shrunk (see Fig. 9). Fig. 9: Encoder housing with the fixed data cable. 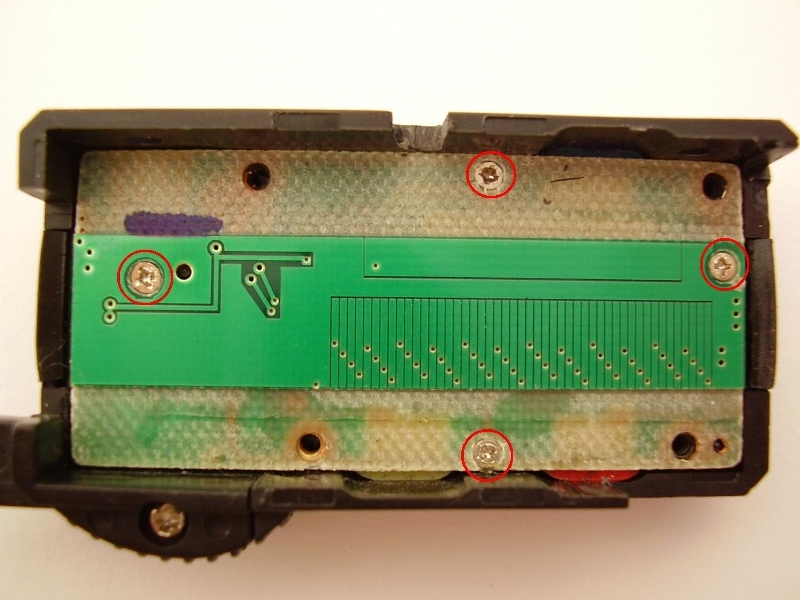 · When soldering the encoder PCB, attention should be paid to a clean soldering tip and short soldering times. 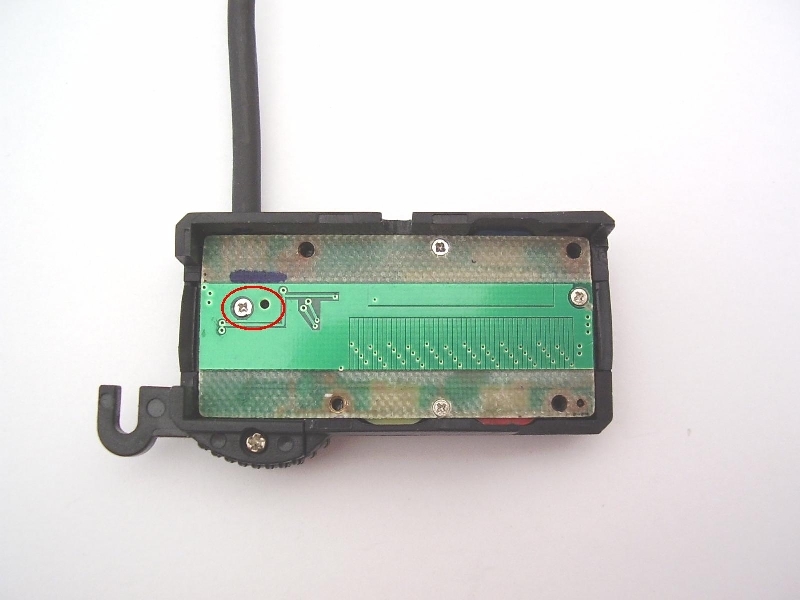 · The power supply of the caliper is via two wires of the data cable. 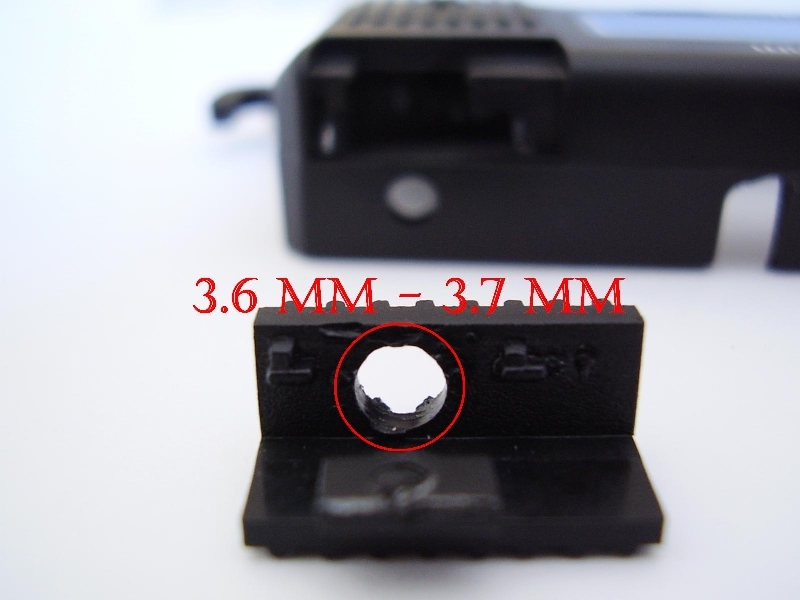 Instead of the battery contacts (see Fig. 10), a 470 nF capacitor can optionally be soldered to smooth the supply voltage. Fig. 10: Pin assignment (C = Clock, D = Data) of the data interface with the 470 nF capacitor. 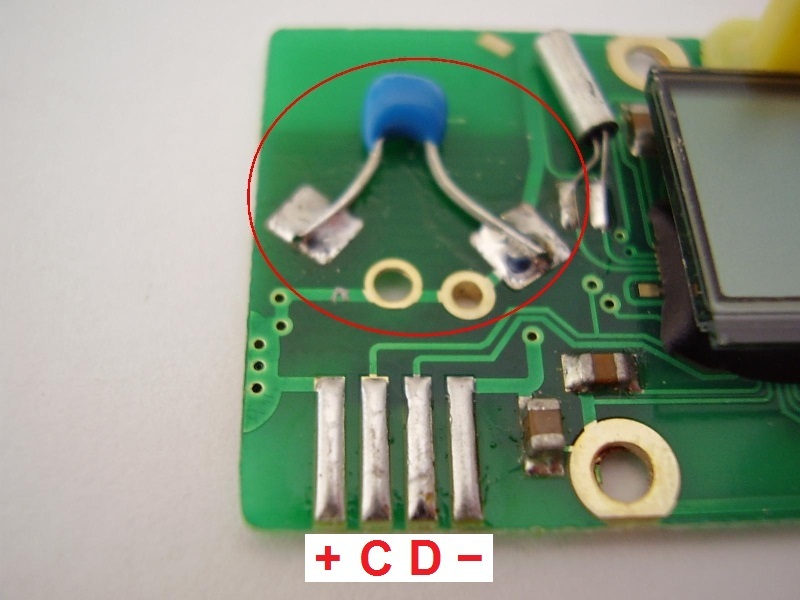 · The data cable is soldered according to the pin assignment from "inwards" (see Fig. 11). 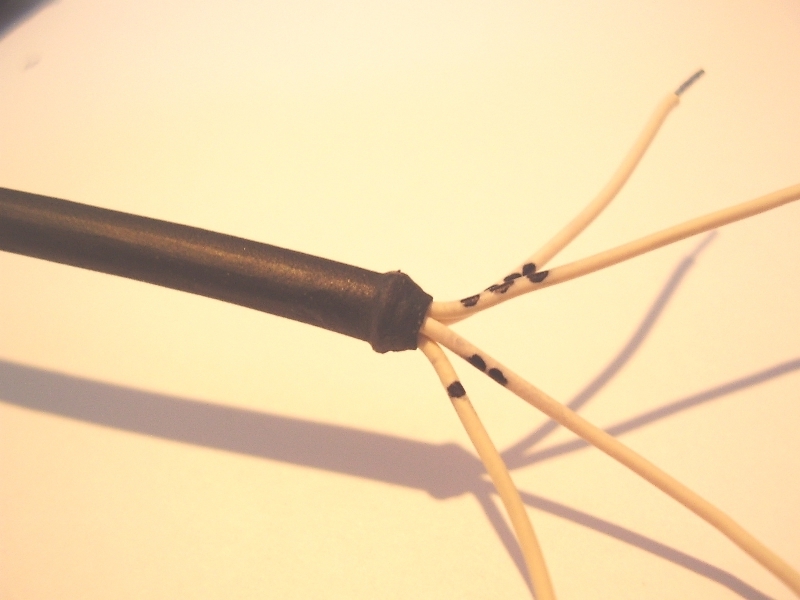 · To facilitate the soldering, the copper wires have been twisted and covered with a thin layer of solder. Fig. 11: The data cable is soldered according to the pin assignment from "inwards"
· After the data cable is soldered, the encoder PCB can be mounted back into the housing. · The individual wires of the data cable must be routed so that they do not overlap switch contacts or screw holes of the encoder (see Fig. 12). 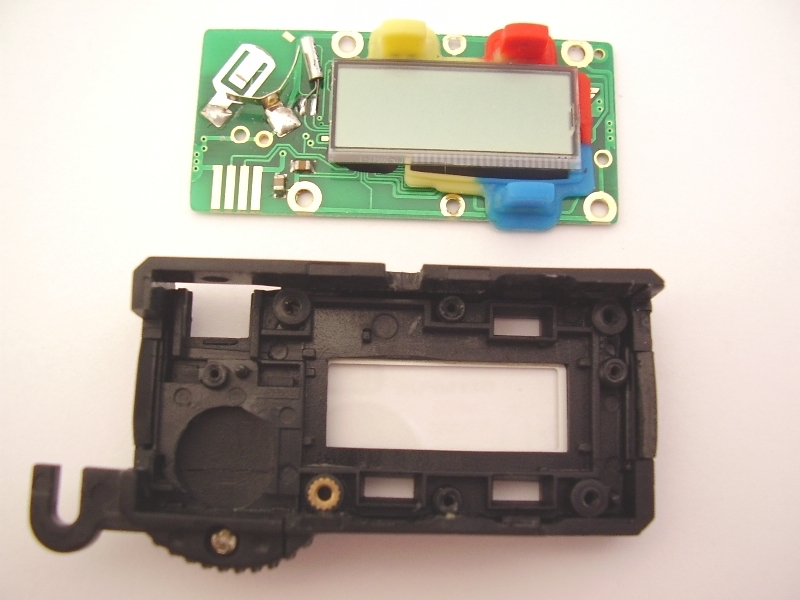 · The PCB must fit perfectly into the housing before screwing together. Fig. 12: Mounted encoder PCB with data cable. · In the final step, the encoder is mounted on the metal caliper body. Fig. 13: Ready-to-use retrofitted caliper.